North Thompson Oxbows East Park protects a stretch of wide meandering river system with a high level of diversity in a very productive part of the upper North Thompson river lowlands. North Thompson Oxbows East Park is situated 50 km north of Blue River and 280 km north of Kamloops. Access is by logging road, 6 km west of highway 5 (Yellowhead) where the North Thompson River crosses the highway. The communities closest to this park are Blue River, Vavenby and McBride. 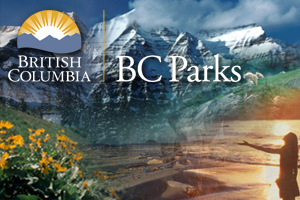 History – This protected area was recomended through the Kamloops LRMP process and formally established on April 30th, 1996 as a provincial park through Order-in -council under the Park Act. The park was then designated in Scedule E of the Park Amendment Act. Conservation – This park protects floodplain wetlands, numerous oxbow lakes, sandbars, back channels,levees and glacial river. Plant communities are indicative of cold air drainage and wet soils,small pattches of old growth hybrid spruce, and subalpine fir. Wildlife – This park protects excellent moose habitat. Habitat for wolves, grizzly bear, and beaver Important habitat for bull trout, Rocky Mountain whitefish, and rainbow. One of the few stable bull trout populations in the region. There are opportunities for canoeing and kayaking at this park. Always exercise caution when navigating the North Thompson River. Sweepers and log jams may not always be visible in advance. Fish species include rainbow and bull trout, Chinook and Coho salmon. Anyone fishing or angling in British Columbia must have an appropriate licence.